The Ash-Leaved Maple tree (Acer negundo 'Flamingo') is rather interesting in that it carries striking variegated coloured leaves, that is they are a pale green colour with salmon-pink edges, which change to white as spring changes to summer. Groups of yellowy-green flowers in spring are a feature of interest with this tree. This tree is fast-growing, with a broadly spreading form and with a final height of 12m (40ft) is ideal for a medium sized garden. 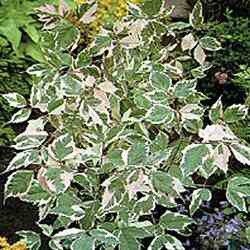 We recommend this tree is planted in a partially shady spot as its delicate leaves are sensitive to hot, intense sun. Ash-leaved maple is supplied at a height of between 1.5 and 1.7 metres in a 12L container, which means that this tree has an already established root system and therefore this tree can be planted any time of the year and with better results than either bare-root or rootballed trees.